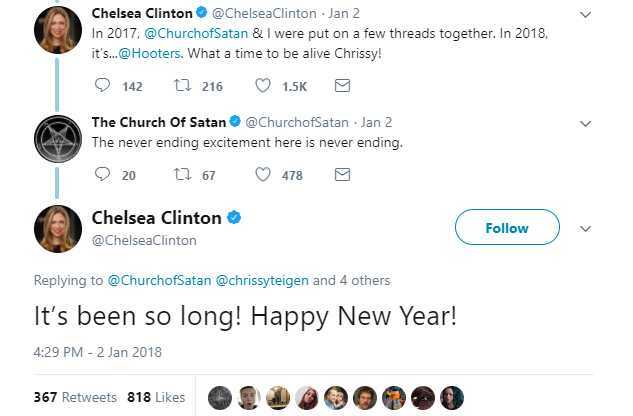 Twitter users are expressing concern after Chelsea Clinton wished the Church of Satan a “Happy New Year” on Tuesday. The matter began as Clinton had commented on a tweet by model Chrissy Teigen, who was upset that someone had posted photos of her daughter in making claims that she and her husband were a part of the “pizzagate” scandal. Tiegen responded and said that she felt sorry for what Clinton’s family had dealt with, and sent her love to Clinton’s husband and daughter. An account named “roguehooters” later commented on the tweet, and a reader tagged the official Hooters account to notify them that someone was posting under their name. Twitter soon suspended the rogue account, and a Hooters representative responded to the tag, stating that they do not endorse the account nor was the user affiliated with the risque’ restaurant. Tiegen, who had simply been chatting with Clinton, then saw the discussion below her tweet and asked what was happening. “In 2017, @ChurchofSatan & I were put on a few threads together. In 2018, it’s…@Hooters. What a time to be alive Chrissy!” Clinton remarked. Since Clinton tagged the Church of Satan in mentioning them, the group commented back. “The never ending excitement here is never ending,” the Satanic group wrote. “It’s been so long! Happy New Year!” Clinton responded. “Same to you. Here’s to a great 2018!” the Church of Satan replied. The exchange left some readers scratching their heads, with some remarking that the Clintons must think well of the group. “If only @HillaryClinton could be as honest,” one commenter wrote. “This tweet says SOOOO very much, Chelsea,” another stated. 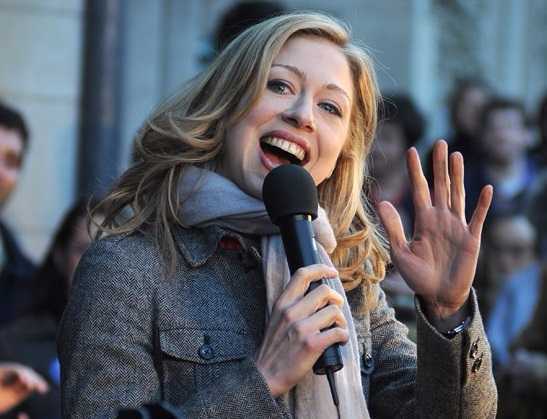 “How fitting [that] Chelsea Clinton wishes her satanic and demonic friends a happy new year,” a third remarked. Clinton soon replied to the first commenter, Rhonda Kazmierski, opining that people can be cordial or friends with those who don’t share their religious beliefs, and that sometimes, they even intermarry. The Church of Satan has since chimed in on the controversy, stating that neither they or Clinton worship Satan, and that they were simply engaging in polite discourse. “Like we stated before, if someone is polite to us, we respond in kind. We’ve been very courteous with folks on the other side of the political spectrum who approached us the same. That this is shocking news is fascinating in and of itself,” the group tweeted. The Church of Satan was founded in 1966 by Anton Szandor LaVey, and according to the group’s website, its members identify as atheists.